We call it Beauty Feel - the unique comfort that comes from Beautyrest Super Pocketed Coil springs, performance foams and luxurious fabrics all working together, providing an unparalleled night's sleep. 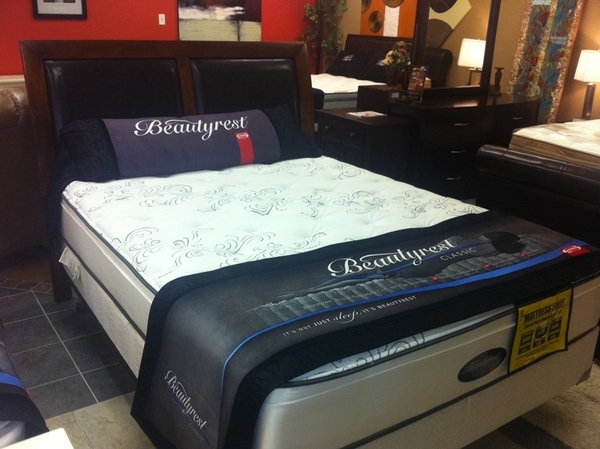 Completely redesigned for 2011, only the new Beautyrest mattress offers individually pocketed Beautyrest Super Pocketed Coil springs for unsurpassed motion separation, conformability and durability. Please select Triton or Standard, NOT BOTH! The Simmons beauty rest mattress uses the optional TRITON Box spring which is the only box spring which will match this mattress covers 100% however they are much more expensive than a standard box spring. We are now offering the standard box spring option for our customers who are looking to save money. We have successfully sold hundreds of these Beauty Rest mattresses with the standard box spring and we have had no problems with them at all. However please be advised that Simmons does not have to warranty the mattress if the damage is determined to be caused by the standard box spring.